News & Press | The Congratulator | Congratulate your Connections! 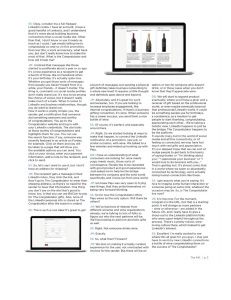 Napa Valley Life Magazine interviewed The Congratulator’s Josh McHugh and Dan Braun for a feature in its November/December 2014 issue. The piece turned out great – in no small part thanks to Tyson Law‘s slick work on the images of the Congratulator in action. 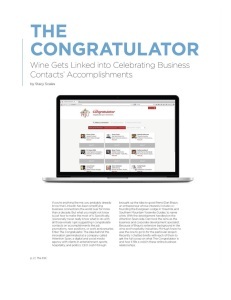 Check out the Napa Valley Life Congratulator feature! The Congratulator business-gifting platform, leveraging LinkedIn’s APIs, makes it easy to congratulate colleagues and friends with a great bottle of Peju wine. September 3, 2014 – Los Angeles, CA and Rutherford, CA - Attention Span announced the launch of The Congratulator, an innovative business-gifting service that helps you congratulate your professional connections on career milestones like new jobs, promotions and work anniversaries. Peju Province Winery is Attention Span’s exclusive Congratulator launch partner. In keeping with Peju’s long-standing practice of blending award-winning, sustainable wines with charitable giving, the winery’s involvement with The Congratulator also includes a give-back component. In response to the recent earthquake and along with many others, Peju is committed to helping the Napa Valley community as it starts down the long road to recovery. Ten percent of proceeds from sales that come through The Congratulator will be donated to American Red Cross Disaster Relief, an organization that immediately responds to disasters in the US, ranging from earthquakes to fires, hurricanes, floods, tornadoes, hazardous materials spills, transportation accidents and explosions. The Congratulator, located at http://peju.congrats.li , shows which of your LinkedIn connections has recently marked an occasion that calls for celebration. Once you select the person to congratulate, the Congratulator offers a curated set of gift options. At launch, the first three options will be Peju 2011 Napa Valley Cabernet, Peju Brut Sparkling Wine, and Peju 2011 Fifty/Fifty. With a few clicks, the gift is on its way to its recipient, and you are on your way to being forever associated with a peak moment in your connection’s career. The Congratulator will allow payment via Bitcoin and all major credit cards.